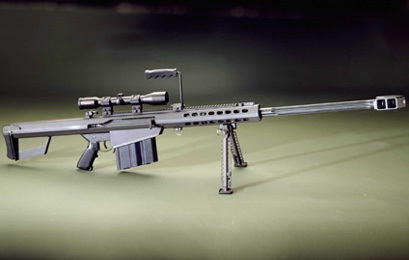 Barrett's Model 82A1 has been used for years by our military. It is chambered for both military and civilian ammunition. The semi-auto design and super-efficient muzzlebrake make the 82 a pleasure to shoot. It comes as a neat package, and fits in a standard-size carrying case. The "Kit" comes with a 10-round magazine, Leupold scope and heavy duty hard case. Price includes a hardcase and cleaning kit.